Switch to the store view on the top left to your current website or store view. Under the Debug tab of the same Developer config page you will see a new option appear that will allow you to turn on/off template path hints. Remember to clear your cache. How to make it show for only your computer? In the same screen where you would enable template path hints, enter your IP address in the dev console filter field (first field in the Developer config screen).Click here to see what your IP address is if you dont know. If you do this correctly, your computer (or anyone else with the same WAN IP address on your network) will only see the template path hints, or anything in the developer config for the matter. 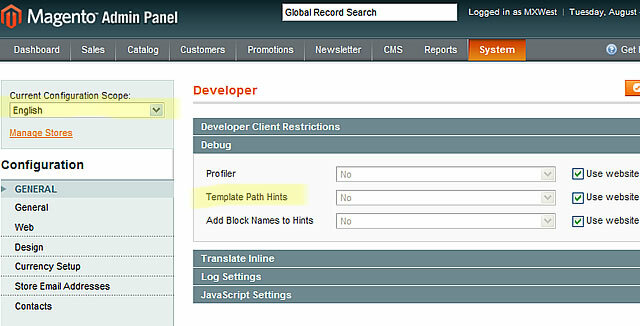 Template Path Hints are controlled by a setting under the “Debug” pane. Visit System >> Configuration >> Developer. But wait. What if you don’t see it? That's really very awesome and superlike your wonderful share...!!! it too easy login into magento back-end.Than Go to System > Configuration and Developer section on the bottom left under ADVANCED To Switch to the store view on the top left to your current website or store view and Open Debug and set “Template Path Hints” = Yes. Keep up the superb piece of work. Thanks for your information. The post is informative. Thanks for sharing how to turn on templte path hits in Magento. Login to the magento back-end. Go to System > Configuration. Go to Developer section on the bottom left under ADVANCED. Open Debug and set “Template Path Hints” = Yes. Go to Developer area on the base left under ADVANCED. Change to the store see on the upper left to your present site or store see. Open Debug and set "Format Path Hints" = Yes. Under the Debug tab of a similar Developer config page you will see another alternative create the impression that will enable you to turn on/off layout way implies.